"I could never have someone else raise my child"
Oh, the mommy wars. Even though I'm a babywearing, birth choice-advocating, "breast is best" kind of mom, nothing irks me more in the scheme of mommy wars than the hate I see online for working moms. There's been times in my life I've had certain opinions about a group of people without ever having interacted with someone from that group. Then, when I befriended someone who held that opinion and I talked to them about it, my opinion changed. Sometimes, you don't know just how off your viewpoint is until you're confronted with the opposing one. 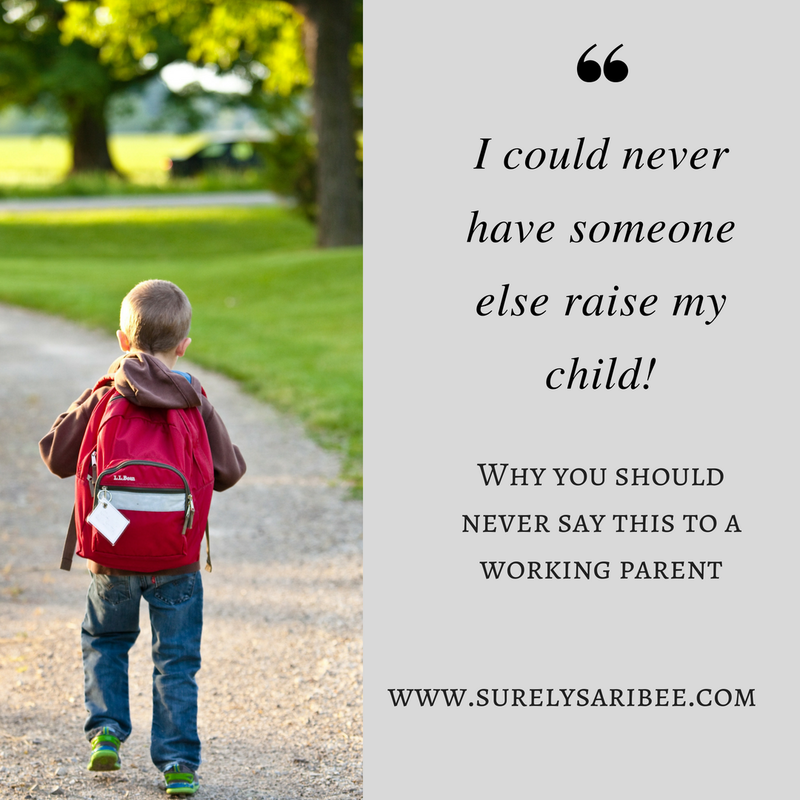 "I would never have someone else raise my child." Me neither! Daycare does not raise my son. They're a partner with us in parenthood. Just as other families may have extended families and friends and neighbors and a church family behind them to help with the task of bringing up a child, so do we. Our "village" that is helping us raise our child just so happens to include a wonderful daycare provider. Our daycare provider is equipped in ways I'm not. She's a former nurse and has experience with at-risk youth. She's teaching our son baby sign language and Spanish. She's a mom of two boys so she's been there, done that! Often as soon as we walk through her door in the morning, my son tries to flail our of my arms into hers. And then he does the same for me when I come back through the door in the afternoon. I trust her opinion on things but she's not making the decision on how and when to wean him, how to introduce solids, how to discipline, etc. She doesn't insert her opinion on our decisions. When I started struggling with my milk supply once my son became mobile, she was supportive of the time I spent laboriously trying to increase my supply. Eventually, when we came to the difficult and emotional decision to start supplementing our son's milk with formula, she was supportive of that as well. She tells me if there's any health issues with my son during the day or if there's any changes and I'll sometimes ask her if she thinks it's worth calling the doctor. She's an experienced mom herself so I can trust her judgment. Just like I may message my mom or my aunt for perspective on parenting, our daycare provider is a valuable resource who is more experienced in this whole thing than I am. Yet, there are still times where I will trust my "mom gut." She may watch him for eight hours a day, which seems like a lot, but there's still 16 other hours in the day and weekends. Yes, he's sleeping for much of it, but a majority of his life, he is in our home with me and my husband. When parents of school-aged children send their children off to school, nobody says to them, "I could never have school raise my child!" When a father goes back to work a week or two after his wife gave birth, they don't tell him upon his return, "I would never leave my baby all day! "or "I could never have someone else raise my child!" Just because my son started spending part of his day with a daycare provider when he was an infant does not mean he's being raised by daycare. Raising a child doesn't stop when they go to school. Raising a child doesn't stop when they go to daycare. Raising a child doesn't stop when they learn to drive. I am a 24/7 parent. I don't get days off. When I'm at work, I'm thinking about my son. I take breaks during the day and structure my schedule around pumping milk for him. I reschedule events and meetings to be sure I'm there to put him to bed or pick him up from daycare. 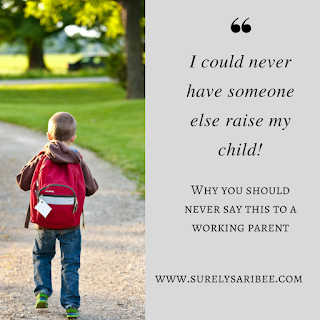 The sentiment of "I could never have someone else raise my child" suggests that working parents are LESS committed to their children than stay-at-home parents, which is absolutely not the truth. I'm so committed to my son that I help provide for our family to put food on the table and a roof over his head. I'm so committed to my son that I take my vacation days to care for him when he is sick, rather than going on vacations. I'm so committed to my son that I spent hours and hours calling over 50 daycare providers to find him a safe, loving place to spend part of his day. I'm so committed to my son that I meal plan so that cooking dinner doesn't take away from the time I have with him in the evenings. I'm so committed to my son that I structure my workdays around pumping milk for him and making sure he sticks to the same dropoff and pickup times at daycare each day. That boy thrives on routine. So, don't you dare say that I'm not raising him.